For a band, the siren song of touring can feel part reward, part obligation. Our four-part series follows four area bands and takes you into their vans and venues to find out what it’s really like to hit the open road. It’s often said that touring can make or break a band. Spending days together in a hot tin can, and hours in unknown cities waiting for show time. But if there’s no one else in your band, that tin can might get a little lonely. Nicholas St. James dominates a stage in a way that few solo performers can, capturing audiences with his ebullient, vigorous vocals and vaudevillian stage personality. 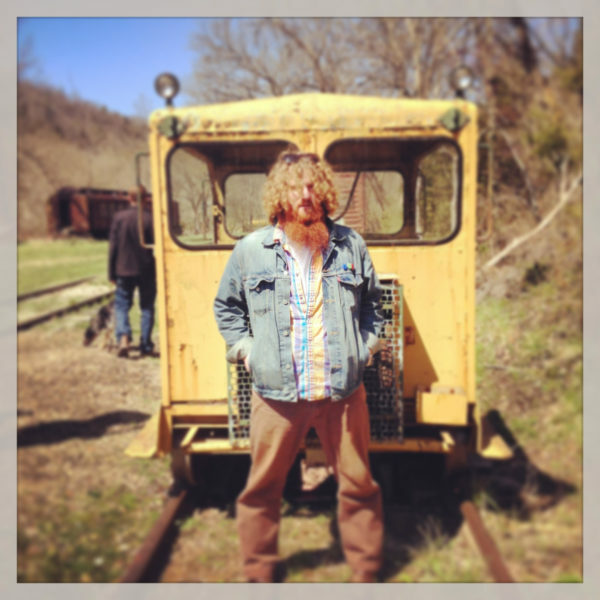 As a full-time musician, St. James makes his living with residencies at various venues in Kansas City and Lawrence, Kansas, including The Oak Room at the InterContinental (every Thursday), The Westport Saloon (every fourth Friday) and Jazz Louisiana Kitchen (every fourth Friday at rotating locations). For the past 2 ½ years, the one-man act has also taken his eruptive show to towns across the Midwest, playing in bars, fairs, farmers’ markets and breweries. Do you have a favorite or least favorite place to play? The road is ever-changing; your favorite town today could be hell tomorrow. What makes a great stop on tour is a random mix of a place that feels new, familiar, exciting and relaxing. However, a lot of touring is dependent upon your attitude, so it’s imperative to go into each town/venue ready and excited to play your best show — you’ll make more friends this way, too! If touring is mostly about keeping a positive attitude, imagine how infuriating it is when the odds are against you from the start. There are two primary examples I encounter. The first is a town with isolated scenes that aren’t too keen on outside entertainment. The second is a venue with a booker who is bad at their job. Both of these problems can force you to skip over a town, even if you have to drive through it on your way to another joint. When you started touring, what was the biggest challenge? Booking has to be everyone’s answer at the beginning. Even with help, you’re doing a lot of swinging in the dark, trying to get folks to take notice and give you a chance. Also, life on the road just isn’t for some folks, no matter how bad they want to be a touring musician. Hell, most of The Beatles weren’t too fond of being on the road, and they gave it up once they’d achieved enough fame to do so. What’s the biggest challenge now? Putting together shows that are more events than just another “bar gig.” At some point, playing the same small venue with the band you played with the last two times through just doesn’t work. It’s hard enough to make a show relevant in your hometown, so imagine the difficulty of putting on an event in a town 400 miles away. What are the advantages and disadvantages of touring as a solo outfit? I can literally go wherever, whenever I want. Also, as a folk artist, I fit on many bills and in many venues, so I’m allowed about as much freedom as an artist has regarding their time spent on the road. However, there are major disadvantages to this; namely, lack of teamwork. As a solo artist, you are doing everything on your own most of the time: the booking, the promotion, the driving, performing, merch, etc. Even the addition of someone else in the car for the long drives can improve morale on the road; and honestly, it’s probably not terribly safe to travel alone at great length. There's a lot of downtime on tour. How do you keep yourself entertained? I’m not too sure the answer to this is any different than it would be if I were traveling with a band or crew: museums, songwriting, historical sights, songwriting, booking, promoting, baseball and songwriting. Do you have any funny habits or rituals you do on the road? Talk about a person you've met on the road who has impacted you. The one person who has stuck with me was a solo performer I saw on an off-day at an open mic in Tennessee. He had been driving around the US for 5 years, playing open mics 7 days a week. This particular open mic was not very busy, and he played for nearly 2 hours, with just two originals in a set consisting of mostly early ‘90s covers. He set up a merch display that rivaled anything I'd ever seen at stadium concert, and continued to aggressively push his wares every few songs during his set. This performer made me realize how blindly acts can get sucked into touring, almost like it's expected they do it after so long. More importantly, I realized I needed to reassess my own reason for touring and set some boundaries. I make no personal judgment on this performer as he seemed perfectly happy with his choice to operate this way, and sure, he's probably played and seen the full 48 contiguous, but I continue to wonder what his plan was, or if he even had one. What is the most important thing you've learned about yourself through touring? Any amount of touring will quickly let you know if you truly love music and entertaining — I do. There is nothing in this world more rewarding and less selfish than music, and touring is the best way to implode that perfect relationship if you’re not prepared. Would you ever consider adding another member to tour with you? That’s the million-dollar question for a solo act, and one I am asked often. I’d love to add a few more folks to the lineup. Perhaps some folks get the idea that a musician who predominantly plays solo is someone afraid of collaboration — this is not true. It’s understood by most touring acts that anyone on the road with you needs to be contributing to the show in some way, and those folks need to be compensated. The goal has always been to add folks to the stage so tunes can be fully realized. A fuller ensemble also opens more doors and usually provides better time slots. Best advice to any band that wants to tour for the first time? Talk to other friends and local performers who have toured the way you want to. There are a lot of different ways to tour, far more than I could ever imagine, and it shouldn’t be a surprise that others in the same game are willing to offer guidance and assistance. That being said, you don’t have to tour. Many acts view touring as a necessity and start on the road far too soon. I’m also a firm believer that touring isn’t as important for independent artists as it once was, and there are much more cost-effective ways to reach new audiences. Folks just don’t go out to listen to live, independent music like they once did, and there is nothing worse than driving any distance to play an empty room. My advice for someone looking to tour for the first time: don’t. It’s no different than that big hometown venue you’ve wanted to play since you were a kid — they’ll ask you to play there once you’re ready. Touring is the same in that you basically have to do it when the time comes. Why is it important to tour, both for you as a musician, and for you as an individual? As an entertainer, one is always trying to better him/herself and get their music into more ears. Touring isn’t the best way, but still a good way to accomplish this. Also, as someone who truly loves to entertain others, it’s always nice to see a few new faces. As an individual, once one becomes comfortable touring and has made some lasting relationships on the road, you almost have to travel to keep balance in your life. Nearly everyone on the planet wishes they could travel more; I just happen to have an incredibly valid excuse to do so. In addition to his weekly residency at the InterContinental tonight, you can catch Nicholas tomorrow at the Replay Lounge in Lawrence for a matinee show, starting at 6 p.m. —Michelle Bacon is a musician and writer dedicated to the Kansas City music community. She advocates for and helps spotlight music in the area, writes web content for 90.9 The Bridge, and plays with The Philistines and Chris Meck & the Guilty Birds. Her grandma will always be the coolest person she knows.